Placed under the company’s new Mi 4 flagship, it provides a 4.7-inch 720p LCD display alongside a quad-core 1.6GHz Snapdragon 400 chipset. 8GB of internal storage and 1GB of RAM round out the specs, and there’s also an 8MP camera capable of 1080p video and a 1.2MP 720p-capable front-facer. It’s all powered by a 2,000mAh battery. From a design standpoint, it’s decidedly not flagship-grade like Xiaomi’s new Mi 4. It sits rather large in-hand due to the 9.9mm waistline, but the back panel is pleasantly matted to provide ample resistance to fingerprints. The Gorilla Glass 2-covered display does not provide the same feature, but it’s not as bad as other midrange devices we’ve tested. The dual-SIM support and removable battery were nice extras. The user interface is Android 4.3 Jelly Bean with Xiaomi’s MIUI overlay. We were disappointed that the Android 4.4.3 KitKat build from the Mi 4 didn’t make its way onto this device as well, and there are a few features that had to be cut in order to run on the downgraded hardware. There are no thumbnails in the task switcher, and the camera didn’t feature live filter effects like we saw on the Mi 4. 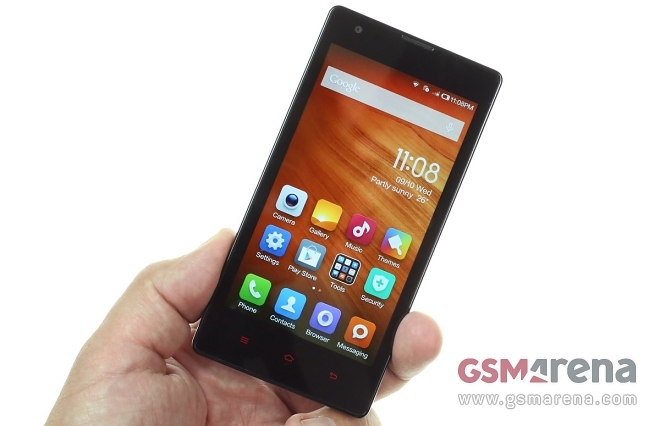 Be sure to check back with us next week for our full review on the Xiaomi Hongmi/Redmi 1S.